I got the soundblaster part running fine under dos and windows, using generic ESS drivers - but I can't get the synth to play... port 330 seems to be looking for an external synth trough the midi port, and the internal ES696F synth is quiet... anybody manage to get one of these playing synth midi music in dos? 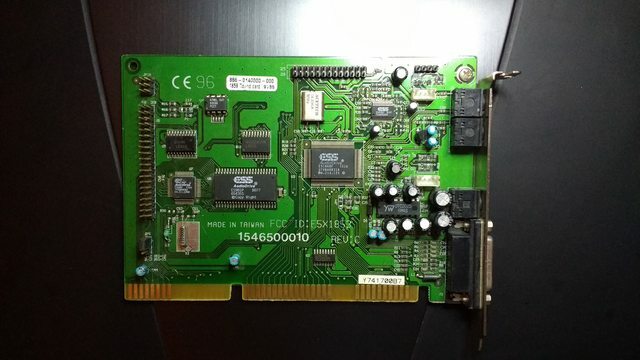 ESS ES1686 + Dream SAM9407 Synth - 4MB of on board ram + 16MB max on a simm socket. This guy won't even play SB sound in dos. The on-board ram and any ram I put in the 72 pin socket get pretty warm. The card is detected and configured correctly under both dos and windows, but there's no sound whatsoever. Again, I used generic ESS drivers for the SB compatible part. I didn't even try to get the Dream synth working. Since the ram gets pretty warm, the card may be dead - but maybe I'm doing something wrong? Any help with either of these (particularly the BTC 1859) would be greatly appreciated. Works for me now. If you want to load a different .94b wavetable you have to rename it with the original 1 MB .94b name. You normally use ESSCFG.exe and check the recources. Best is to turn of the IRQ for the MPU Port. Did you use the correct ESS driver? I mean for ES1868? It should be no problem to play at least FM and SB after ESSCFG initialization. I used the same es1868 driver as for the behavior tech card - both are detected correctly, but there's no sound from the guillemot. How do I turn the IRQ off for the MPU port? I'm not even sure I can set anything manualy - when I try, esscfg states that PnP or something else is configuring the card, and ignores all command line parameters... I did turn PnP off in bios. kanecvr wrote: I got the soundblaster part running fine under dos and windows, using generic ESS drivers - but I can't get the synth to play... port 330 seems to be looking for an external synth trough the midi port, and the internal ES696F synth is quiet... anybody manage to get one of these playing synth midi music in dos? I don't have one of those exact cards but I know that the wavetable header is muted by default on my ESS cards - try turning everything up to maximum using ESSVOL.EXE and see if that helps. If games don't complain about not finding anything @ port 330 then your MPU is probably working OK. I un-muted everything and I still can't hear any synth music from port 330. I read somewhere that the synth might output to another port, but I tried all of them and nothing is detected . If I select port 330, a synth is detected but nothing plays. Is it possible that there's a piece of software or a jumper that needs to be set for internal synth to output? where he configures a similar ESS card and has a link to drivers? Phil mentioned that some games don't work with ESS cards. Has anyone found examples? phil's card doesn't have a ES696F wavetable synth. He's using a basic model w/o an on board midi synth. gdjacobs wrote: Phil mentioned that some games don't work with ESS cards. Has anyone found examples? That's not true. The ESS 1868 has great SB compatibility - there's no games that won't work on it. Some older titles require adding the SET BLASTER argument in autoexec.bat, something that most drivers don't do automatically - maybe that's the problem he encountered. Again, the sounblaster part works - I get wave output and OPL3, but no synthesizer music from the ES696F chip. I know that boxpressed got one of these working - maybe worth pinging him and asking the question? In my experience, they have great compatibility as well. He might have been thinking of a theoretical possibility of incompatibility which, I suppose, might exist. But still no Synth music out of the ES690 chip. Turns out the card behaves as if the chip isn't there and outputs directly to external MPU401 via the joystick port, since connecting my SC-55mk2 yields results when selecting general MIDI on port 330h. Is the wavetable header active? I would expect the ES690 to simply be tapping the voltage level MIDI bus and not be switched at all. The ES689 is supposed to be pin compatible with the ES690, so you can do a lot of checking just by probing with a DMM. You'd want to check Vcc, GND, the reset pins, and the enable pins for the ROM chip. With an oscilloscope, you can check the clock signal and MIDI data pins. gdjacobs wrote: Is the wavetable header active? I would expect the ES690 to simply be tapping the voltage level MIDI bus and not be switched at all. Unfortunately I have neither a wavetable synth or an oscilloscope at my disposal... The only things I verified is that the chip is getting power, and it gets a bit warm after the computer's been on for an hour or so. One thing I did notice the 2.2 ohm axial leaded resistor is cracked (bottom left of the card). I replaced it with a regular carbon film 5 ohm resistor (can't find a 2.2 ohm one to salvage), but still no sound. Said resistor is connected to an SMD capacitor and that is connected in parallel to the crystal under the ES690 chip. I don't know what that circuit is supposed to do, but maybe it's the way the ES690 is triggered? Looks like they used that resistor as part of a series filter circuit. It's intended to block low frequency noise and/or DC offset. I don't think it's an issue, but can you parallel a second 5 ohm resistor to get closer to nominal impedance? RESET - might toggle to 5V, but should be nominally at GND (thus not in a reset condition). TE - should be at GND. CEB - should be at GND. OEB - should be at GND. I can't get the BTC 1859 to play synth music off the es690f regardless of what I do. The chips seems to work fine, but the soundcard chooses not to use it, outputting midi signals trough ports 330h to either the joystick port. 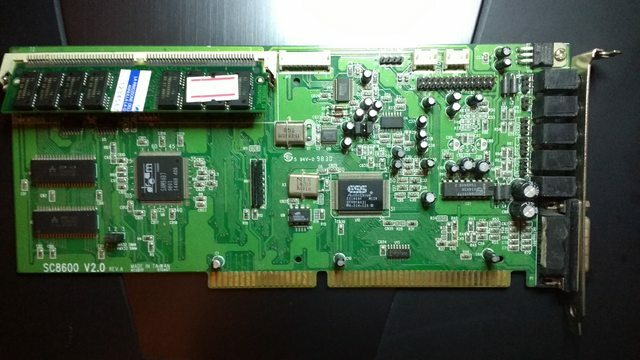 On the bright side, I got the Guillemot Maxi Sound card to work in both DOS and Windows 98 using drivers from it's original driver CD. The Maxi needs to load the firmware to work properly. The BTC usually initializes the wavetable but the sound line is muted. The line is aux. Try essvol /? for help on how to use the mixer.